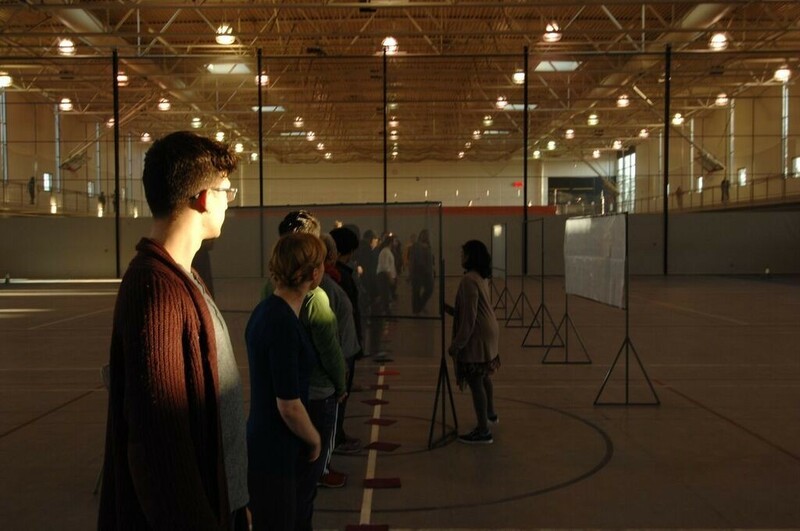 For this year’s Northern Spark festival the performance collaborative Aniccha Arts will present Census, a 100-person event beginning with dusk on July 11, 2016 and continuing nonstop until the sun rises. At the heart of this production is a deep investment in a collaborative and integrated sense of process, where the artists have drawn from various personal histories and disciplines to arrive at a common language of physical embodiment. Census facilitates a return to public space and the self-expression of individual bodies. Referencing the strategic unruliness of recent marches and protests, Szyhalski sees the event as “reclaiming the public street as somewhere that is democratically possible. We are using the subtle language of art rather than overt politics.” And rather than being prescriptive, Census is a responsive work of art. The critical mass of over 100 moving bodies allows for audiences to see a demonstration opposing the institutional pressures that alienate communities. A lead team of 13 collaborators began sketching Census by asking two questions, “how do we work across and within communities simultaneously, and how do we organize people towards a critical mass?” For Aniccha Arts, this tipping point is ambiguous, and not for them to define or even predict. The purpose of Census brings people together and generates productive friction as a means to achieve the potential of a critical mass. Especially when placed among the themes of Northern Spark 2016, Aniccha Arts converts the audience into community. Those who experience Census will inevitably disperse and return to their homes, and they may carry it as a model to continue building this potential energy towards a critical mass of interconnected action. The spirit of this project goes beyond the task of diversifying representation. Intersectionality is a core value of this project, allowing a more nuanced understanding of systematic injustice and social inequality within our communities. Experiencing the sheer scale of Census enhances the realization of the power of collective movement and coordinated action. The pun of performing/creating Census points to the implications of demographic enumerations as the US government’s decennial process tends to produce artificial images of a given populace. “People don’t like to be counted and boxed,” Vasudevan reminds us. Census could more accurately, “looks like a document that shows the ways the world patterns itself within each body.” Census the performance becomes a differently helpful census of people, a mutually constructed living document of our own community designed to be an organic recording of each others’ bodies. In relation to Northern Spark 2016 themes Move and Perceive, witnessing the event becomes a form of live data analysis. The murmuration of starlings returns here as fruitful metaphor to understand the emergent process of Census. A flock of starlings is known as a murmuration, and together, preparing to roost, they align themselves in the sky like a flag whipping in the wind. Without a leader or an immediate destination the starlings respond nearly instantaneously to one another within their physical network. The mutual influence of each bird affecting its neighbor in flight harkens to a mathematical model called scale-free correlation, often used to track the “’criticality’ of crystal formation and avalanches — systems poised on the brink, capable of near-instantaneous transformation.” Moments of improvisational solutions carry Aniccha Arts through their creative process as team members brainstorm and test ideas together and apart. As with many ideas brewed by the collaborative, the connection with murmuration appeared coincidentally during early rehearsals of Census. Through this project Vasudevan encourages a “co-dependent creative process.” To produce and polish the sketches of Census, Vasudevan and the team of 13 have designed several perspectives, as they call them, from which to develop the final version of the performance: movement, light, object, technology, and text. Two different members of the team lead each perspective, allowing the project to develop separately and in unison. They routinely return together to share new and scuttled ideas. Like a murmuration of birds, the decision of one perspective affects all others.